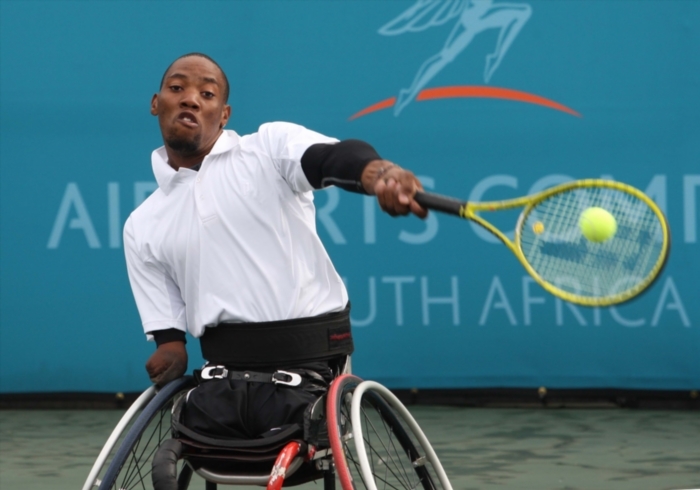 South Africa’s Lucas Sithole and Kgothatso Montjane led the way in Benoni as the top seeds progressed in the wheelchair tennis Gauteng Open on Thursday. Second seed and South African quads favourite Sithole set up a semi-final clash with Canadian fourth seed Sarah Hunter after beating Queen Nlapo 6-0 6-0 at the Gauteng East Tennis Centre. Hunter overcame a shock 5-7 first set loss against American Mark McLean to eventually win 6-3 6-0. “Sarah is a good player with a lot of experience. She’ll give me a tough test, which is what I want for this tournament to get me ready for next week’s Airports Company South Africa SA Open,” Sithole said. “I’m happy with how I’ve come through these two matches and retained my focus and concentration in them. I think I’m building well for next week. At the top end of the quads draw, top seed and world number one David Wagner continued to work off the jetlag with a 6-0 6-0 victory over Britain’s Antony Cotterill. “I still feel a bit tired from the flight over but it was a good second round for me,” Wagner said. Wagner will face his first major challenge of the tournament when he comes up against Britain’s Jamie Burdekin, who beat him in the final of the Cajun Classic last month. In the women’s singles, South African second seed Montjane played her first match of the week on Thursday, and moved straight into the quarterfinals with a 6-0 6-1 victory over Siphokazi Fuma. “It wasn’t a tough match but I took a lot out of it in terms of what I want to still work on. And I know I’ve got some tough matches coming up. I’ve got a lot of points to defend these next two weeks for my world ranking, which puts the pressure on me, so I’m just focused on doing the best I can,” she said. Sabine Ellerbrock secured her place in the quarterfinals with a 6-1- 6-1 victory over South Africa’s Rosalea Van der Meer. “It was a good start, but there’s always something to work on,” said the reigning Australian Open champion. The most immediate concern for Ellerbrock was getting used to the altitude, and an outdoor environment for someone who plays most of her tennis indoors in Germany. “It’s tough to get the rhythm here because the courts are fast at altitude. “I was an able-bodied player before, so my mobility on court is something I’m always very aware of,” she said. Men’ singles top seed Stephane Houdet of France beat Poland’s Kamil Fabisiak 6-0 6-0 to also make the quarters. He faces sixth seed Tom Egberink of The Netherlands in the quarters. Men’s singles second seed Gordon Reid and third seed Takuya Miki also progressed.